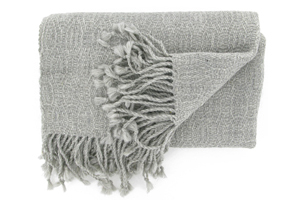 Naturally shiny, silky and soft, the Alpaca's fibers from the Bolivian Altiplano are also warm and very resistant. To arrive at this unique level of softness and elegance, Andes Made exclusively uses baby alpaca and the finest alpaca fibers hand-picked according to their quality and color shade, then washed and combed before being spun. Each Belen stole is made by hand and is the result of this ancient textile culture and unique manufacturing know-how using both traditional and innovative natural techniques. Stole made ​​in Bolivia, in accordance with the principles of fair trade and social responsibility. Specialised in Andean knitwear and fashion accessories, every year Andes Made features ethical fashion accessories in superior quality alpaca and lama wool ,that combine fashion, fair trade, luxury fabrics and exceptional know-how. The quality and refinement of these original materials can be found in all their models: stoles, scarves, mittens and hats. The best Alpaga wool combined with a genuine know-how is the secret of these easy to wear basics for winter. The style is pure, plain and simple. The models are soft, warm and lightweight.